OK, you're still reading. In that case, I'll clarify that the Clifton I have is the "cheaper" Smoke-colored waxed canvas-leather hybrid. ONA also makes a camouflage print one of these with waxed canvas, but the other versions available have full leather exteriors priced all the way up to $499. So what does one get the ONA Clifton? The Clifton features a waxed canvas exterior with full-grain leather and brass hardware. 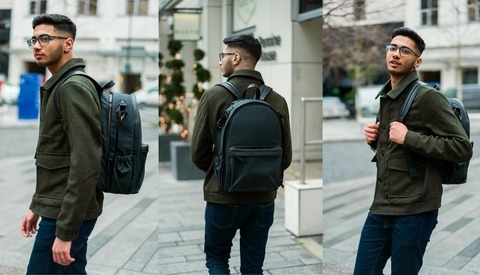 The front organizer pocket, shoulder straps, exterior zipper pulls, top handle, and bottom panel of the backpack are leather, along with accents on the side pockets and back panel. It looks really good in my opinion, and I've received several compliments while I've worn it. The Smoke color that I have can develop wear marks on the canvas that I personally like the look of, however if the ideal backpack for you appears flawless and unused for years this material might not be the right fit. Both sides of the exterior have slim pockets that are just large enough to fit my hand sliding in them. One could use these for lens filters, fitting a couple legs of a JOBY GorillaPod, memory cards, granola bars, or any other smaller accessories. In general it can't fit a water bottle in these pockets, but one of those recyclable plastic 16.9 ounce bottles found in convenience stores do squeeze in with a bit of compression. The back panel and shoulder straps make light use of air mesh padding. While it's not robust, this isn't a backpack I would be carrying very heavy loads to where the amount of padding is insufficient. In my use I find it to be the right match of padding for the everyday type of bag it is meant to be. The exterior measures in at 17.5 inches tall, 11.5 inches wide at the bottom, and 5 inches deep. The interior shaves half an inch to make it 17 by 11 by 4.5 inches. Moving to the interior, there's a dedicated and lightly padded sleeve on the backside that will readily fit 13-inch laptops. While the sleeve technically can fit a 15-inch MacBook Pro, the laptop presses against the top canvas walls of the backpack with a lot of pressure and would surely damage something in no time. If you place the 15-inch laptop outside of the sleeve on the inside, there's slightly more vertical space but it's still too tight for peace of mind on the top edges. The ONA Clifton comes with two removable storage inserts for organizing camera gear and accessories. According to ONA these inserts fit a total of one camera and four to six lenses, but to me it seems like there's never enough space because of how slim the inserts are. Camera bodies will want to be flat on their back, adding to the space they take up, and larger lenses might bulge when you zip them up. You can check my photos in this article to approximate how your kit will fit in; I tried using a few different recognizable accessories to help visualize the space. Mirrorless cameras and travel-friendly lenses will be most at home here. I will admit that the removable inserts are a bit disappointing considering the backpack's price tag. While the actual bag looks premium and feels premium, the inserts feel like an afterthought. If you were to hand me the inserts alone and ask how much they'd cost retail, I'd say $20 for the pair. I don't think that should be my answer for a high-end backpack. Everything is flimsy like there's simple packing foam between the fabric (it has a crinkly sound that backs up that feeling), and the dividers have loose fitting fabric over a thin piece of structure material. The Velcro on the dividers have a light to medium amount of stick, which is OK for the type of gear you can store in them. The backpack's materials (excluding the storage inserts) feel premium to the touch. The leather bottom panel is a nice addition for durability. Solid looking backpack that gets compliments. Carry-on friendly and worked as my only bag on a quick two-night trip to New York. Fit my clothing, toiletries, a camera with one lens, and a GorillaPod fitted to a side pocket. The two removable storage inserts feel quite cheap and to me don't fit with the high-end backpack they come with. It can't comfortably hold a 15-inch laptop, which is standard issue for many photographers. If you ignore the dedicated sleeve, it can be done, but wouldn't do it repeatedly. Exterior side pockets aren't big enough to hold a reusable water bottle. The ONA Clifton Camera and Everyday Backpack is available now for $419 in Smoke or Camouflage waxed canvas, $429 for Black leather, and $499 for Antique Cognac or Dark Truffle leather. Gosh that sure is "fancy" and it got compliments...looks like the company decided to market it to photographers without doing any research. "Yet is it still worth every penny?" To me F-stop gear could be worth it. 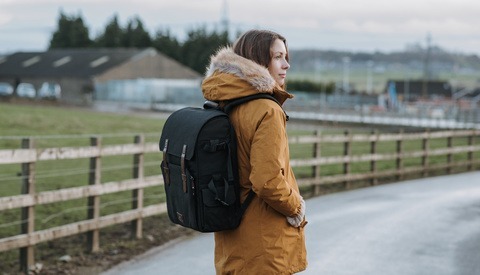 It's not cheap, but so far I haven't seen anything as versatile and robust as their backpacks. Useless. You couldn't pay me to use that bag. I'd pay $200 max and that's only because the materials are good. Plus this bag is only "viable" for a mirrorless system. It's too bare bones to be charging up to $500. Not worth even half that price in my opinion. But then again, Ona cater to those who are more status and less function. 400 usd for a school backpack? This i really dont understand, why in earth will you buy such a bag, unless you want to show off, and it doesnt even look nice, like the messenger leather bags. While I agree and can attest to the quality of ONA products, I can't understand a camera "city bag" that doesn't have side openings to grab your camera. It's plain slow, cumbersome if you can't put the bag down (at 400$' I'm not going to drop it on the ground of my city...). Pretty but useless. Their messger bags make more sense and are absolutely tough.